On the 14th November, the Adaptation Network hosted the 2018 Annual General Meeting (AGM) of the Network. This meeting marked ten years for the Network since it was founded in 2008. 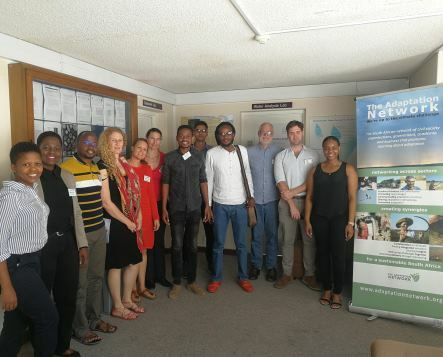 Each year the venue for the Network’s AGM rotates between South African cities, and this year the AGM was hosted by the Climate Systems Analysis Group (CSAG), an organisational member of the Network, on the University of Cape Town’s upper campus. As per previous years, the AGM offered an opportunity for members to meet and exchange experiences and views, whilst also shaping the strategic direction of the Network and attending to its governance. This year, a number of important changes were up for discussion. After 4 years acting as host to the Secretariat of the Network, the Environmental Monitoring Group (EMG) had previously announced that it was stepping down from this role, and the appointment of a new Network Secretariat was a crucial decision to be made by the membership at the AGM. A total of 21 individual or organisational members were in attendance at this year’s AGM. The incoming Secretariat appointed by the AGM is the African Climate and Development Institute (ACDI), which was welcomed unanimously by members in attendance. EMG will continue to provide Secretariat services to the Network until the end of the 2018 year, and will support the transition to ACDI for 2019. In order to help with continuity, Dania Petrik, the current Network Coordinator, will continue to provide support to the Network and the host on a part-time basis in the new year. The AGM also elected a new Steering Committee (SC) of the Network to serve in the coming year. With new key organisational and individual members stepping up to the task, the incoming SC is an enthusiastic and highly-energised team, with the motivation to take the Network to new heights in the coming year. On behalf of the Network, we’d like to thank these members for giving their time and capacity to continue to drive the Adaptation Network forward in all its endeavours and according to its mandate of inclusivity. This year’s AGM also adopted significant amendments to the Constitution of the Network, which create a democratic space for Individual Members of the Network to participate in its governance as electors and office bearers of the organisation. Following a robust discussion, the proposed amendments to the Constitution adopted. Associate Professor Gina Ziervogel (from UCT’s Environmental and Geographical Sciences Department) presenting on key learnings from the Cape Town drought to Network members. Her talk noted that the most important aspects learnt from the drought include the paramount importance of vertical and horizontal integration of governance, data that is both understood and correctly applied, and climate resilient infrastructure. A Systems approach to scarce resource management underly the City’s success in ultimately avoiding DayZero. We would like to encourage all member organisations to consider whether they would like to change or adjust their membership status in support of these amended changes, and to ensure that members are engaged and supportive of the Network prerogatives. Leadership of the AN, and of the SC meetings. An Adaptation Colloquium in 2019, should an AN member agree to host and coordinate it. Representation of the Network on relevant national bodies, such as the National Climate Fiance Advisory Body and the NIE’s Project Advisory Group. Representation at key events by AN members, and feedback to AN members via the newsletter, the forum, and social media platforms. In addition, the Steering Committee and Secretariat reported on the activities undertaken in the past year within five portfolios: Capacity Development & Learning, Communication, Policy, Finance & Fundraising and Internal strengthening of the Network. Full minutes of the AGM will be circulated to the Network shortly. This entry was tagged ACDI, adaptation, agm, cape town, constitution, CSAG, DayZero, host, meeting, members, membership, practitioners, steering committee, UCT, vote. Bookmark the permalink.